I have decided to integrate my blogs into a single new blog. 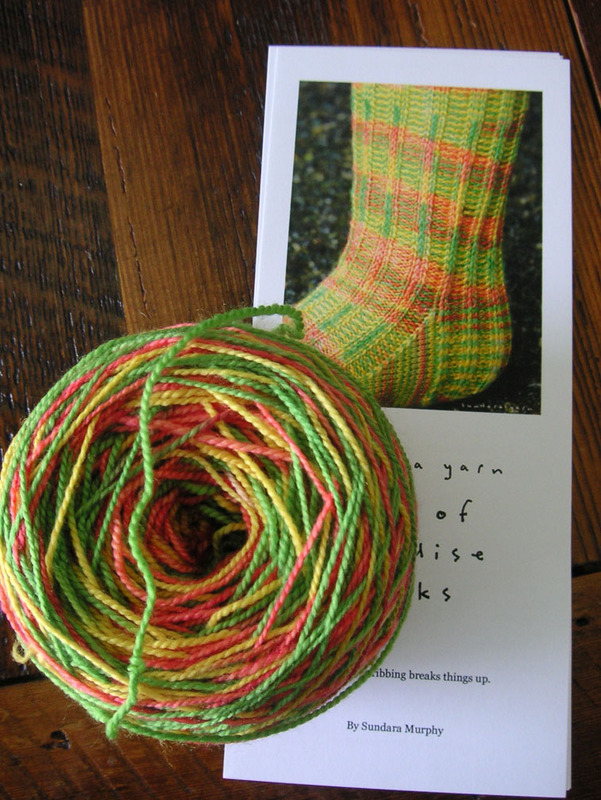 There will be links to all posts here on the new blog, but topics will range beyond knitting. Please join me at restingmotion. A week has passed. Intended progress has not been made. Perhaps, my plans were a bit ambitious, although they did not seem at all so. I have not finished the gray sweater although I do intend to finish it before I leave for Knoxville. Little progress has been made on the striped cardigan because little time has been spent with it. Yet I don't feel particularly frustrated by my lack of progress. There has been much singing of Christmas carols to myself, even as I worked on non-holiday inspired projects like sewing. Snow on the ground only serves to brighten my spirits more. The tree is up and lit, although not fully decorated yet this year. It has been put on the sun porch, which is not heated but is protected by sliding glass doors from the rest of the house. It is a safe place to leave a tree with a young cat in the house who feels it his mission to climb every mountain. Since we will be away Christmas week, it seems like the best coarse, and I am content to see the sparkling lights twinkling in multiple iterations as they are reflected between the windows and sliding doors, sparkling in the dark winter night. Cookies have been baked and distributed and, if I have not been knittng, I have at least finally been assessing the state of the yarns stash which is piled up behind closed doors in the library, safe from young kitten claws. 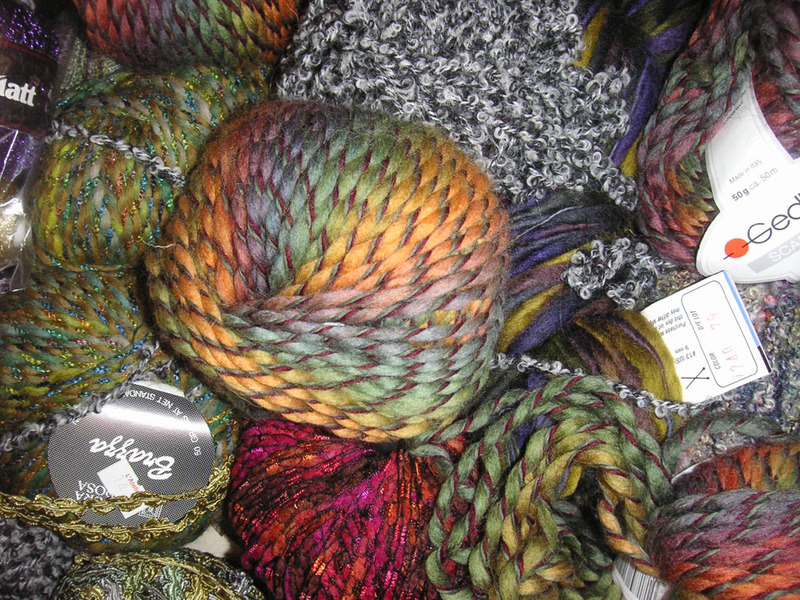 The process of sorting, indexing, and putting away has begun, and although I am somewhat overwhelmed by the amount of yarn in residence, I am also very much enamored of every skein, eager to start every project "right now" as I pick up the yarn and put it away. New projects are tempting, but the projects that are here waiting are calling to me strongly now; egging me on to finish the piles and mountains that are dragging me down. I don't think the UFOs will be finished this year, aside from the grey cardigan. I have other priorities at the moment but that mountain of sewing and finishing as well as unravelling and remaking must begin soon after the new year begins. In the meantime, I hope to make progress with the yarn stash, organizing and putting away, and although I don't think I finish that either in a week, significant progress can be made. A lot has happened since I started this blog in March of 2005. I suppose we all grow and change with time, and yet it seems like 2005 was a lifetime ago. In March 2007 we learned that my beloved had lung cancer and our lives changed completely, before we were even completely aware of what was happening. Several health crises later, this summer has been the calm where we reclaim our lives, where we finally begin the retirement we thought we were starting two years ago. We are still discovering what this new stage will bring, we are still discovering if this is another period of quiet before the storm, or if perhaps the calm will settle in for a while. I have been using the time exploring various creative interests and also catching up, slowly oh so slowly, on the many many things I let slide over the past two years. So much sliding was going on around here that it is fully possible that, had we not shored up the deck and the pool that was sliding down the cliff to the house below, the weight of all my unfinished obligations might have pitched us over the edge. But we learned that there is more steel and concrete in this family than just that which holds the newly rebuilt deck and pool in place. I have been knitting and sewing, and I have several finished projects that are finished or nearly finished, but I have also felt a certain miasma concerning my blogs. It has not been that I don't want to write. I write daily in my journal. I think of blog posts and yet they never materialize. I am not the person I was in 2005. At one point my life seem fragmented, so fragmented that I felt broken into a thousand tiny pieces. There were pieces of my life that seemed held together by the presence of the blogs. But now the blogs themselves seem fragmented, no longer offering a true reflection. Each of my blogs started with a clear purpose and framework. At the time they worked. But this structure, and the very existence of multiple blogs no longer works for me. I need to find a way to integrate my blogs into my life, not fragment my life into my blogs. Oddly enough it came to me while I cleaned out the china cabinet this weekend. It had been a long time, since before G's first bout with illness, before the lung cancer, and it was desperately in need. The glass front of the cabinet was cloudy and smudged, the glass shelves harbored a layer of dust, the glassware itself was dull and lifeless, much the way I felt my life had become until very recently: dull, lifeless and full of dust. So Saturday night, late, I covered the table in plastic and towels, brought out a couple of large basins of water and set to work. It was the kind of task that I put off because it seems like such drudgery, and yet once begun I savour the process. After removing everything from the cabinet I dusted and polished the wood, removed the glass shelves and polished them until they shone, and the cabinet was there waiting to be populated, fresh and shiny and like new. As I cleaned everything and put it back, I started reflecting on the history of the pieces and how they reflect our lives, our families, our history. There is the very modern scandinavian china we chose and still love and the large contemporary hand thrown plates with the silver and black rims we purchased when we threw an engagement party for G's daughter. There is the lovely silver chalice given to us by G's aunt Hilda on our wedding day, the chalice that was given to her grandparents on their wedding day in 1866. I thought of Aunt Hilda as I polished that chalice and looked at the faded photo of her grandfather that remains on the cup. Aunt Hilda's cup shares the cabinet with my grandmothers water goblets, my great-grandmother's china and my great-aunt's china. I felt like I was in the presence of these women as I dipped the plates and glasses in water and gently dried them with piles of linen towels. A couple of Vaseline glass plates from my grandmother became collection of uranium glass, accumulated slowly over the years. The yellow-green glass looks beautiful in front of the plates that G's grandmother brought with her from Austria, one of the few family possessions that survived the move. There are the champagne flutes I don't even like, but which were given me by two old dear friends, now both deceased, who I feel are with us in spirit every time we use the glasses. All of these things coexist harmoniously in this cabinet, each contributing another piece to the puzzle of what makes us who we are. As I listened to my murmuring thoughts it occurred to me that as old and new live in the china cabinet, all my ruminations, thoughts, and passions can live in the words of this blog, and it is this blog that is the perfect place for me now. When I started writing Purls and Murmurs in 2005 I chose the name because I love the way my mind can wander when I am knitting, and the way the word purl can function as a noun or a verb, thereby fitting all my purposes. And yet somewhere I had left the purling of my thoughts and behind and let the blog become a repository of plans, patterns, and finished objects and not a place of dreams and reflections. Here I will continue to write about knitting. But I will also write about my sewing and gardening and whatever else catches my fancy. If you come here only for the knitting I hope you will not be too disappointed, but I had almost forgotten that I am writing this blog (once these blogs) for me. I hope you will join me. As to the archives of Dooney's world and Sewdistracted, for now they will continue on in their current locations for now. I see that I have much to learn and I hope to be able to create a place here where all the archives of all three blogs can exist in one place. 2008 was a pretty good knitting year for me. My output was not as ambitious as some years, but most of my projects were successful and I enjoyed knitting them and wearing the finished results. The obvious winner of the year was Granite. It looks great, it holds up well, and I just love wearing it. The fact that I also get compliments every time I wear it does not hurt either. It is probably about to be retired until the weather warms up again, as it is not really a winter sweater. But then, winter that is too cool for Granite is just perfect for Dreaming of Spring, my second favorite sweater from last year. I am using all the scarves I knitted as well and am quite fond of them as well as the fingerless mitts and the boot liners, which are crying out for a second pair as they are in quite heavy rotation. There is only one real miss in the 2008 output. Compare and contrast looked nice in theory but I didn't like wearing them together on me. They did look good on Matilda, the dressmaker's dummy, but she doesn't really get a say. In retrospect I should have put some shaping in at the bust on the vest, as it gaped open every time I wore it even though there was enough room all around. I wore the under-sweater several times over a tank or a turtleneck, but it seemed to catch on everything and snagged very easily. Once at the mall I caught a sleeve on something and made a long rip up one arm and at that point I just gave up on it. Rage Management is beautiful and warm and snuggly but I have lost weight since I made it and it is truly a little big. The neckline no longer stays in place (it did when I knit it) and it borders on sloppy more than comfy and cool. I haven't yet decided if I will reuse the yarn and knit it again, but The yarn is rather fuzzy and I am not sure if it will hold up to reknitting. This may be given away. Lilac Serenade is also turning out to be a bit of a disappointment. The problem is not with the sweater pattern or its shaping. I love this pattern and will make it again and again. Here the problem is due to my own pig-headed choice. The yarn pills badly and there are always long yarn worms appearing on my sweater as I am wearing it. Now I did check ravelry and this was noted by many users of this yarn, but I just ignored their advice. I bought this yarn because I just fell in love with the color. That said the sweater has been versatile and I have worn it a great deal. It too is getting a little loose and baggy looking. This yarn will not be salvaged however, and it still looks good enough to see me through a couple of months, at which point I will simply say good riddance and toss it. I will be making this pattern again, in several different yarns as it is just the perfect versatile cardigan for me. That's it for 2008. Not a bad year at all. Hopefully 2009 will be even more productive. If you want to see a picture of me wearing the Vignette shrug, go look at my other blog, SewDistracted. I have decided that my life no longer needs to be fractured into many different pieces, and I am going to be combining all my fiberly activities in one blog. This blog will continue to exist and shall serve an archival function, but www.sewdistracted.com will hold all future knitting as well as sewing activity. I copied this from Kristi over at fiber fool but I actually got it from Marji . I haven't read my way through everything yet, but I have been thinking about this color meme. Well anything about color is always intersting, isn't it? 1. What is your current favorite color? purples and wine reds generally, although deep true green and deep blue green run very close behind. 2. Had your favorite color changed over the years? Yes and No. I always come back to purplish shades or greens, but I do go through phases where some color or another catches my fancy and i obsess about it continually. Sometimes this is a color that is trendy at the time but often it is not. 3. Is your current favorite color one that is currently trendy? (Do you see it in the fashion rags or on the clothes rack or in the linen aisle right now? How about 5 years ago?) I don't think either purple or deep blue green is particularly trendy now. The greens that have been trendy of late have been too yellow or too bright. I am however currently somewhat fascinated by orange, which is trendy, and bright yellow. The bright burgundies are also in it seems, and those fit into my general "purplish" purview. They go well with orange as well. 4. What is your favorite color combination? That is a much harder question to answer as it is much more variable. I like deep dark browns, the color of dark chocolate with most of the cool pastels. I love dark brown and light bright turquoise. Fuschia and bright orange are a perenial summer favorite. I love midnight navy with green, blue-turquoise (as opposed to the greener kind) with some purples, softer greens with gray. I think there are too many to name, they vary with my moods and the season. Favorite three-color combinations are deep prune/muted leaf green/wine or wine/khaki green/and deep pansy purple, wine/khaki green/deep taupe brown are also very nice. In fact I can go on an on about my favorite combinations that include shades of purple, red-purple, and purple-blue, mixing them with almost every other color in some combination or another. Favorite color combinations that are outside of this range include red/black/white and yellow/light or medium gray/dark gray. Another really powerful color combination for me, perhaps a little too intense to use often is yellow/purple/black. AT this moment I am fascinated by Medium jeans-blue/pine green/amber and white as a combination and combinatons of shadow-blue and mineral-blue with yellow and olive. 5. Is that combination a popular one? (Is it use in prints you see in the stores and catalogs and magazines now? How about 5 years ago?) brown and turquoise is back again. Orange and pink are popping up again as well, primarily because orange is fashionable now. Otherwise some of my color combinations are probably popular at any given time. 6. 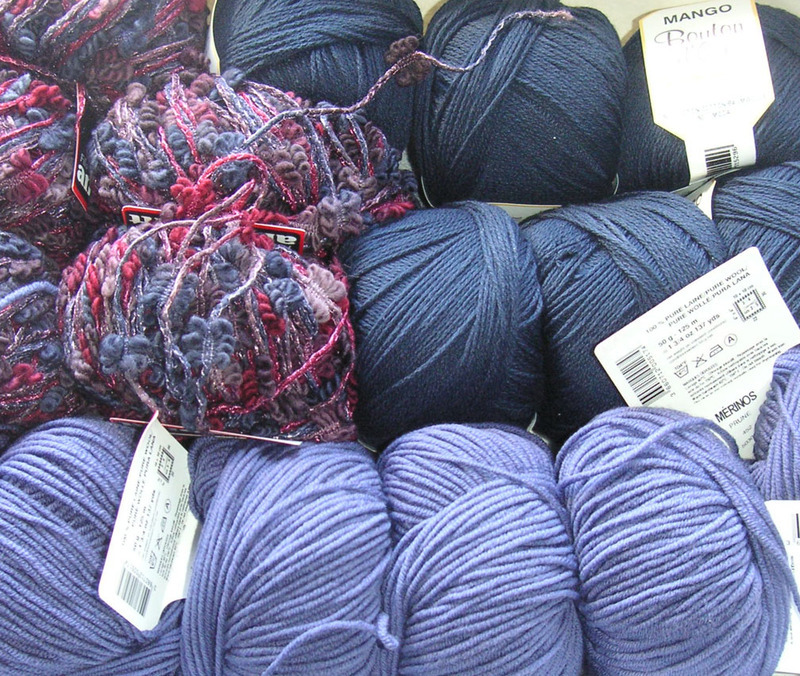 What is your favorite way of using color in your knitting? (Are you a stranded knitter? Do you prefer simple stripes? Do you prefer just accents at the hems/collars?) Hmmm. I've done stripes. Often I just combine whole blocks of a color, like entire garments mixed with garments of other colors. I can play with my combinations more that way. In terms of color-knitting, I have done stranded knitting, and enjoy it, but I also like intarsia. I tend to like an all over pattern like more than isolated spots of color, unless we are layering whole garments as mentioned above. 7. What colors look good on you? reds and greens are probably best. 8. What colors look bad on you? orange and Intense pure Blue and their attendant colors. 9. Do you wear colors that don’t look good on you just because you like them? That is really a tough question. There are colors I can't wear near my face but can mix with colors that I can wear, as for example in the discussion of orange above. But I don't wear most oranges or yellow-browns, or golden colors. There is some part of me that feels I want to wear any color I love and will try to find a wear something if I love it enough, and I have occasionally fallen in love with something in every portion of the color wheel. Generally my skin tone is cool as is my hair. But my eyes are green and they have a lot of olive/yellow in them, and there are certain warm yellow greens that are quite attractive on me. As I have gotten older my hair has actually gotten darker, it used to have a lighter, warmer tone, so I am heading more toward cooler colors. But I can't say that I am purely one season. Technically I am a summer but pastels don't particularly suit me and some fall colors do. So I find this whole color thing terribly complicated. Again my hair and skin are cool and my eyes are warmer. Intense pure blue is almost as bad on me as intense pure orange. 10. What is your favorite neutral color? black/white/ivory/tan/brown/gray – if brown or gray do you prefer cool or warm versions of those or does it matter? And, how dark? Deep brown, more to the cool side than the warm side. Grays, but grays need to be more neutral or warm. Blue grays can be difficult just as true blues can be difficult. Increasingly black, which was too strong for me when my hair was lighter and I was younger, and is better now. I assume that eventually the gray will gain a bigger stronghold in my hair, I will be 50 next year, I will eventually taper more toward wearing more grays, but for now I am enjoying black. 11. Is there a sweater pattern that uses more than one color that you’d like to make, but you wish to change the colors from what is published? If yes, which one? What do you not like about the published colors? There is always at least one each season. The problem is that I usually find the chosen colorway to be strikingly beautiful and am never as happy with alternate colorways that I devise that are more suited to my particular coloring. In colorwork patterns particularly this can be quite difficult, or perhaps it is not but I don't understand the complexities of color enough to pull it off. This season I am fascinated by Eunny Jang's Autumn Rose pullover. The problem with it is that the colors are probably too autumnal for me to wear, although there are colors in the sweater that I can wear. But I really like the published colors and a part of the reason I love the sweater is that I love the color combinations; I am just not sure I could wear it. I think the only way I could happily adapt it is to make a large swatch in the published colors and then make swatches in my alternate colorways and live with them for a bit to see what worked for me. The problem is that there are so many things I want to knit that I am not sure I want to devote this much energy to planning this sweater without actually getting a sweater in return. A clost full of sweaters and nothing to wear. It surprises me that given all the sweaters I have knitted over the years, and the number of sweaters piled on the shelves of my closet, that I could not find a sweater to wear today. It is not even that I don't have any appropriate sweaters, just that I don't have the sweater I want to wear TODAY. I think I have the yarn for that sweater. I probably already have a pattern picked out. I probably have several patterns picked out and I probably have the appropriate yarns stashed. And truthfully, even if I started knitting today, it would not be on my back today. In fact by the time I finish the sweater in question, and I am envisioning a 3/4 or long sleeve cotton or cotton blend sweater with a casual weekend kind of feel, it will be too cold to wear it and I will be annoyed with myself yet again for knitting something I can't wear right away. You know that is how sweaters end up on the UFO pile....I start them with great intentions but when they are near to being finished it is the wrong season to wear them so they get put aside and forgotten. When the right season rolls around again, and it always does, they remain forgotten because I am already dreaming of and working on new sweaters which exert a much stronger pull than the old mostly-finished sweater in the UFO drawer. And so yet again I find myself with a closet filled with sweaters and no sweater to wear. Does one ever catch up? Life has been rather involved lately and fiber time has been at a premium. Luckily I have the sock to keep my fingers calm and there have been moments each day devoted to the simple pleasure of knitting simple socks. One of life's interventions came in the form of an electrical fire in my clothing closet last weekend. Luckily it was a small thing, the breaker tripped and the fire put itself out before we came home (we were in NYC at the symphony). All that we found upon our return was a dead circuit and the smell of burnt plastic/electrical wiring in the master bedroom. Now the reclamation process begins. There was very little that was actually burnt, but everything: my clothes, fabric, yarn, and some roving, smell strongly of burnt plastic. Everything has to come out to be cleaned or replaced. Which was meant for this sweater from 2005, which I had just moved back up to the front of the queue. My small stash of rovings were also stored in that closet and even though I really have not spent much time practicing my spinning, I am very sad at the prospect of losing them. The reimbursement is not really the issue, there is not that much money invested in the rovings, certainly under $100, but I still find myself very sad as I really love the colors and the potential they offer. 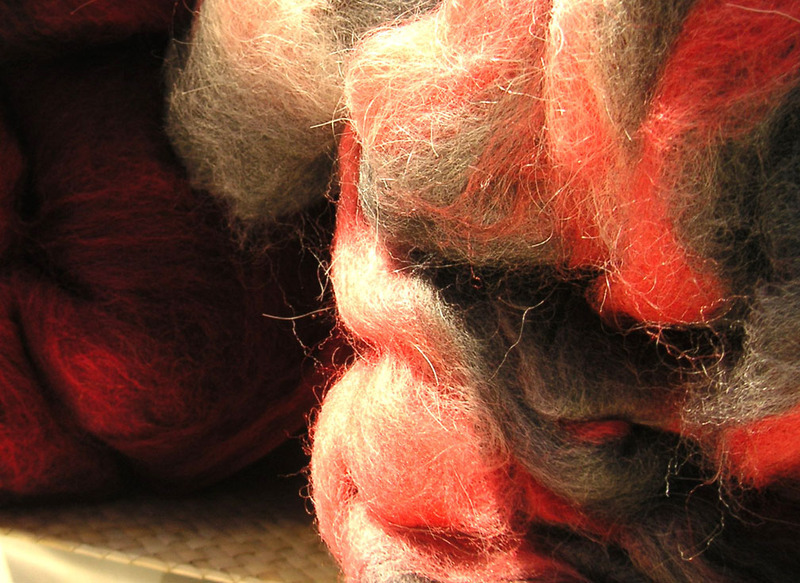 I suppose that if the smell can be removed by washing, the process of felting, with agitation, hot water and soap would take care of it. So I might try felting a small piece of something, perhaps a scarf, to see how it turns out. But I am not sure if I can wash the rovings and still use them for spinning or how I would go about this. I am told I would need to use fairly warm water and a plenty of soap, that water alone will not remove that burnt plastic smell. If anyone has any knowledge or suggestions, please let me know. I suppose I will also inquire at NYS Sheep and Wool next weekend, but at the moment I just feel sad. I might buy a tiny bit of roving, but I don't see me getting much time to try spinning in the immediate future, and I have plenty of roving to deal with in the meantime. Still, we are very lucky. And I am grateful. But I will be very happy if life would go intervene in someone else's plans for a while. September? How did it get to be September, much less the end of the first week of September? My knitting bag is packed for tomorrow's flight to San Francisco where I will be sewing a great deal and probably knitting very little. I will (hopefully) be knitting some though as I hope to debut Passel next Saturday night. Since I am packing no alternate outfit for the party, motivation will hopefully be high. I am wildly optimistic (perhaps blindly so) as I have also packed another knitting project for the latter half of the week, or perhaps the trip home. Sometimes I think the older I get the more I lose my grip on reality. I will be home in about 10 days. On Birthdays, years, and decades. Today is my birthday. And I am fortunate that I am spending it pretty much as I like -- not devoting my time to one particular task, but working on several things I wanted to work on, talking to friends and family, and generally having a very nice day. You will be seeing more of this someday, probably soon, as soon as I get something finished. 49 seems like an odd number, an insignificant year, but it is ending up being a kind of important birthday for me. I think I always go through this on the cusp of the decade change thing. Oh I know that I have another year left in my 5th decade, and that 50 is the big number, the one everyone gets all excited about. But I have never been one to make a big deal about those decade changes. Each time I am looking forward to the next one. 50 will be big because I always thought I would be grown up by then. I may be disappointed. But then I have a year to prepare. At 11:15 tonight I will have successfully completed my 49th year on this earth. Although I will officially be 49 for the next year, meaning I have completed 49 years, I will also be starting to live through my 50th year at 11:16. This is what I find so intriguing. I will no longer be in my 40's. They are done, finished, caput. I am (or will be later today) 49 but I am embarking on my 50th year. It is the same kind of thing as that decade thing. When I turn 50 I will be beginning my 6th decade. And now, I am still in my 5th decade, and I am 49 but I am actually beginning to live through my 50th year. So although I am not yet at a milestone year, and I am not yet beginning a new decade, I am still, in one sense, saying goodbye to my 40's. I have done with them. Isn't this fun? Am I the only weird person who finds this interesting? Being 49 is kind of like being in some in between place, neither here nor there. My 50th year is the end of my 5th decade, and my 50th birthday is still a year away. But my 40's are gone. What happens next? If you read old gravestones, you sometimes find "he died in the 50th year of his life" meaning, well, that he was 49. He made it partway through the 50th year but didn't reach the birthday, he didn't make it to the milestone. I guess I see these "9" years as interesting precisely because of these juxtapositions of the measurement of time. Being 49 is kind of an in-between place, no longer in my 40's, beginning my 50's but not yet in my 6th decade, not yet 50. Kind of like I am in training for being 50. Well, I have a year to practice being the person I want to be when I am 50. I hope it will be enough time.